Located in the heart of Bonifacio Global City, Shangri-La at The Fort is the newest 5-star hotel in this emerging and fastest growing hub of urban lifestyle in Metro Manila. I don't frequent BGC as much mainly because of the worsening traffic in the city but on those rare occasions that I do, I make it a point to do my research of the best places to go and new restaurants to try. When I was presented with an opportunity to stay in the BGC area, I knew I didn't have to look further as Shangri-La is the only hotel I wanted to book and the only place I wanted to spend an incredible weekend with CS. And the moment I stepped in, I knew I made the perfect choice! A few days prior to our arrival, I sent the hotel an email asking for an early check-in which they granted. From the parking, it was a long 10-minute walk to the lobby. Parking is complimentary for hotel guests but after ticket validation, you are only given a 15-minute grace period to get out of the building or you'll be charged the minimum parking fee. It was a policy we think that the management must review as the parking area is not that close to the lobby. Check-in was fast but quite a hassle as the staff was insistent on asking for a government-issued ID for the credit card we were using for the incidental guarantee. CS left all of his IDs in the car so we requested if we can just present it later as the room has been prepaid for anyways. But no, the male staff at the front desk was firm on not checking us in with no ID so we had no choice but to pay the guarantee in cash. It was the first time I have ever encountered such inconvenience and skepticism in any hotel here and abroad, no matter how many stars it has. We did not want to make a big fuss out of the annoyance we encountered in the front desk as this is after all, an amazing weekend CS and I both promised to have. Standing tall at 250 meters high, Shangri-La at The Fort is one of the tallest towers in the Philippines and is a LEED (Leadership in Energy and Environmental Design) certified green building that is committed in maintaining the highest standard of sustainable design. Shangri-La at The Fort's well-appointed rooms with the comfiest bed. When we do stay in a hotel, the first thing we look for, budget aside, is the room's features. Requirements are it should be spacious enough to give us ample space to move around, a clear and decent-sized cable television for our binge-watching and the bed must be comfortable and should smell good! Shangri-la Hotels are known for its luxurious rooms and their newest hotel at The Fort surely lives up to the brand. Recognizing that we are booking a 5-star hotel, CS and I agreed to book the cheapest room to save our travel fund for future bookings. Our corner deluxe room measures a spacious 45 to 47sqm of contemporary design in beige palettes that enhanced the room's sophisticated look. Other features include the comfiest king-size bed with 300-thread count linens, a pillow menu, a 48-inch smart TV with cable channels, a writing desk overlooking the outdoor pools, an IDD-ready phone, bedside lighting controls, complimentary high speed WiFi, a coffee and tea making facility and a mini bar with local and imported goods. The marble bathroom was equally impressive with a separate deluxe tub and shower cubicle. Plush bathrobes and soft towels were neatly folded and kept close to the shower for easy reach. Shangri-La's signature L'Occitane toiletries was proudly displayed on the marble counter top. Shangri-La at The Fort's modern and state-of-the-art facilities. The hotel is home to Kerry Sports Manila, the most comprehensive sports and leisure club you can ever find in the city. Just imagine a massive 8,000sqm of fitness facility with over 90 professional equipment you can think of in one place, it was indeed a paradise for heath and fitness enthusiasts. Located on levels 5 & 6 of the hotel, Kerry Sports boasts an NBA-grade indoor basketball court, an extensive state-of-the-art gym, 2 covered outdoor tennis courts, 2 squash courts, a 25-meter outdoor lap pool and hydrotherapy pool, exercise studios for Pilates, yoga, spinning, kickboxing, mixed martial arts and boxing classes, locker and changing rooms with sauna and steam rooms, a wellness spa and a 1,000sqm indoor playground for kids called Adventure Zone. All hotel guests are entitled to complimentary use of the 24-hour club but they are also open for non-hotel guests with an individual membership fee of Php96,000 per annum. Shangri-La at The Fort's staff who treat you like royalty. I love how the staff calls you by your name rather than just Sir or Ma'am as it makes the experience more special and the service more personalised. Majority of the employees were professional but it was the Guest Service Center and Housekeeping that made our stay truly remarkable with little favors and special attention they directed towards us. When I called to ask for an extra conditioner for my long hair, not only did they sent a bottle but a whole set of toiletries delivered to us right away. We also received a complimentary plate of fresh fruits and another bag of dried pineapple the next day as we did not include the buffet breakfast on our booking to cut down on the room rate. 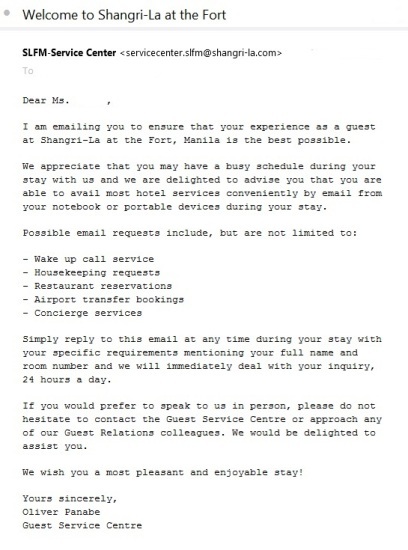 Moreover, Oliver from Guest Service Center sent me an email immediately after check-in stating the things that we can request through email such as but not limited to restaurant bookings, wake up call, concierge services and housekeeping request. We also received random calls from them twice to check if we needed anything. It may sound annoying for other people but I know that its their way of making sure that we were greatly taken cared of and all of our needs were met. In short, they treated us like royalties and never once did I had to follow up on our requests as everything has been thoroughly arranged and delivered to our room the soonest possible time. It was not an easy decision to spend a little over Php12,500 for a night in any hotel as the rate could already get us 2 tickets to Hongkong via Cebu Pacific or book us 3 nights in a beachfront resort in Boracay or Cebu. But for experience sake, we allowed ourselves for an occasional extravagance and spent a weekend in BGC's newest 5-star hotel. And now after enumerating all the things we loved about Shangri-La at The Fort, it was a splurge we had no regrets at all!